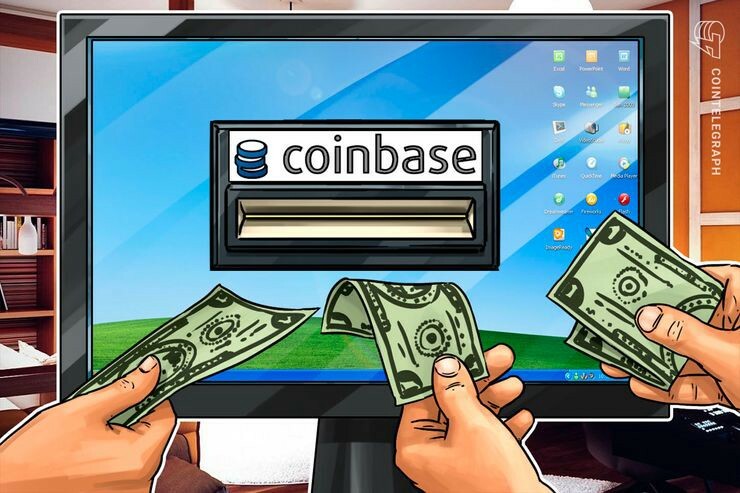 For those following the crypto news circuit, you probably noticed some news come across the wires recently about Coinbase’s decision to add the cryptocurrency, ZCash, to their exchange. Obviously, this news was met with several cheers from those in the crypto community that believe that this addition is indicative of some greater proliferation of cryptocurrencies. However, the underlying story that is not being addressed in these announcements is the one of numerous conflicts of interest in Coinbase’s recent additions. Now, before you even make the comment - the author is well aware of the fact that Coinbase has not technically announced that they are going to add $ZCASH, but it seems almost inevitable that they will at some point. And if they don’t, then Coinbase more than likely named $ZCASH because they were looking to pump the coin’s value. In the piece, I was highly critical of the investment and governance surrounding ZCash as well as Coinbase. As explained on other public platforms, it is not that I have a problem with the technology behind ZCash, specifically. The thing that I have an issue with is the fact that it seems that Coinbase is leveraging their platform for purely self-serving purposes. Specifically, we’re going to look at the names; Barry Silbert and Fred Ehrsam. 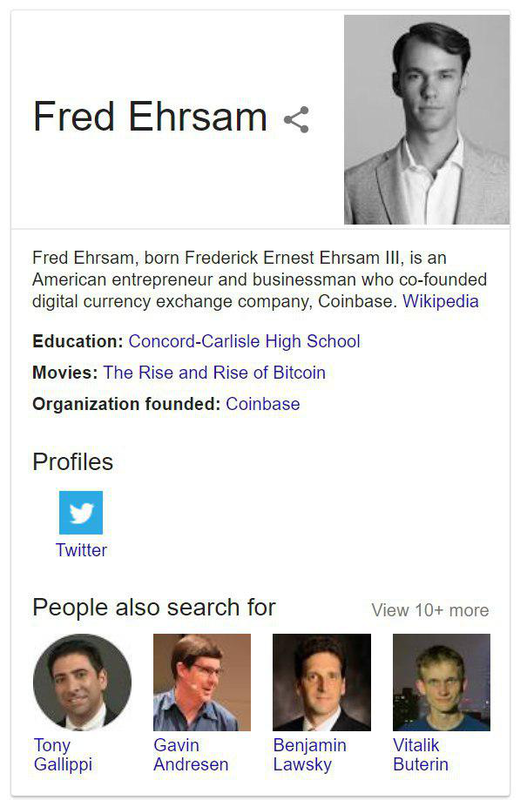 Fred Ehrsam is a co-founder of Coinbase. 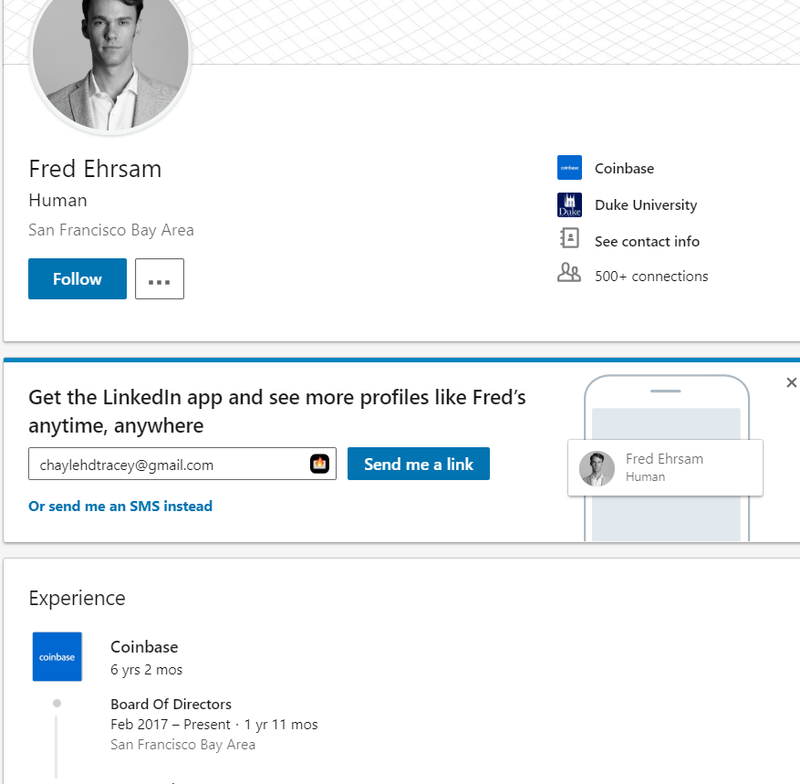 He abdicated his leadership role at Coinbase in the beginning of 2017 but he is still on their Board of Directors at the time of publication (according to his LinkedIn page). Given Fred’s intimate and inextricable involvement with Coinbase, it is hard to imagine that he had absolutely no say in the addition of ZCash to the platform. As a major investor in ZCash, this is a move that no doubt provided a tremendous benefit for him. As we can see in the chart above, it would be an understatement to say that this was a move that benefited Fred Ehrsam tremendously. With no evidence that he has publicly exited the company in any shape or form, we must assume that Fred Ehrsam was able to benefit directly from the exchange he created listing his coin. Now, this isn’t a problem if this is information that is disclosed to the public — but it has not been. Coinbase has failed to make this known on any portion of their site, and this includes the fine print. What makes this addition even more problematic is that it seems to be continuing a trend of self-serving additions to their platform. As of 10am PT on Thursday, October 11, we are now accepting deposits for ZRX on Coinbase Pro! We will accept deposits for at least 12 hours prior to enabling trading. Once sufficient liquidity is established, trading will begin on the ZRX/USD, ZRX/EUR and ZRX/BTC order books. It turns out that it is more than likely that Fred Ehrsam also benefited from that addition as well. Again, the inherent benefits that Coinbase and their related entities would receive from this addition were so obvious that multiple news outlets were able to predict that $ZRX would be added to the exchange ahead of time based on this information alone — and they ended up being correct. It is worth noting that Coinbase failed to disclose this information publicly as well and they have still not mentioned or even alluded to it at the time of publication, leading Zerononcense to believe that this is something that Coinbase will not choose to do at any point in time. Another substantial conflict of interest rests in Barry Silbert’s role with the exchange as well as his involvement/investment in the cryptocurrencies that are being listed on the exchange currently. For those that do not know, Barry Silbert is the founder of a crypto investment portfolio collective called, Digital Currency Group. In addition, Barry Silbert also happens to have a substantial stake in Ethereum Classic (which he has openly advertised a number of times on his personal Twitter account). What Is Bitcoin’s Barry Silbert Doing? I continue to believe strongly, and publicly state whenever convenient to do so, that Barry Silbert’s “Ethereum Classic” scam is, well, a scam. I try to honor as many different beliefs and views as humanly possible – that’s part of what being a researcher, journalist, and investor entails in the 21st century. Thus, in this way, we can see that Barry Silbert (owner of the investment portfolio that has a majority share in Coinbase and ownership of CoinDesk) has profited from not only the ZChain addition, but the Ethereum Classic one as well. The failure of Coinbase to outline the clear conflicts of interest in the coins that they are listing on their exchange is both negligent and malicious in nature. Investors should be aware of such conflicts as well as the fact that they are being actively traded against on Coinbase Pro. Without divulging such information, it is hard to believe anything else that the company is telling folks through press releases and social media outlets. This renders the consequence of eroding investor faith in the platform and could result in potential legal action (despite the binding arbitration mandate in their terms of service) as well as a loss of market share to a more viable substitute in the future that operates in a way that the crypto community finds to be more trustworthy and transparent. Barry Silbert is the owner of DCG (Digital Currency Group). 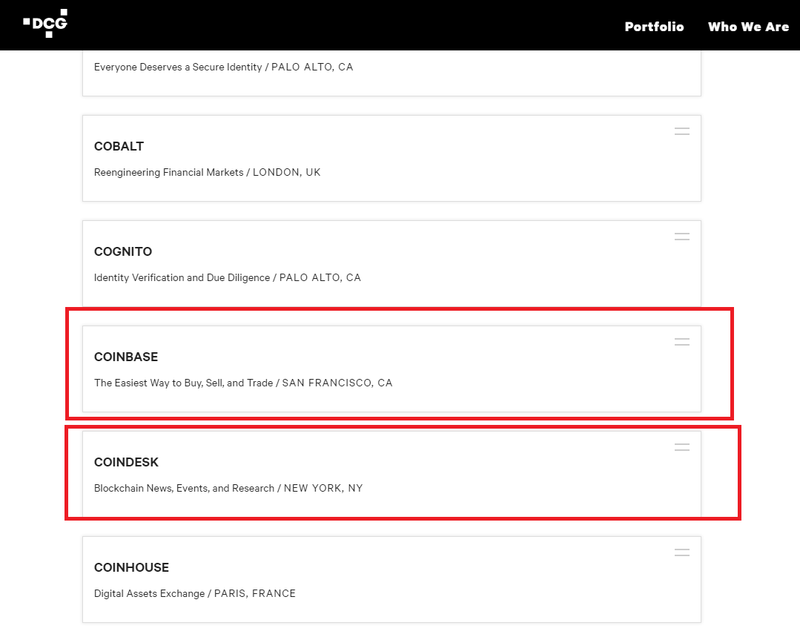 They are a majority share owner in Coinbase (and they also own CoinDesk). He is also a major investor in ZCash.